​The School Library is open to all bonafide students of the school. 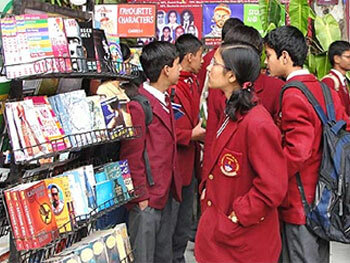 One book will be issued to every student from Class onwards every week to promote reading habits. Students are allowed to borrow books only on their own cards. Strict silence must be maintained in the library. Reference books are not issued. These books can be consulted within the library premises only. Books other than reference books are issued for two weeks. If the books are returned late without a valid reason, the borrowing facility will be withdrawn. Books marked, disfigured or damaged will have to be replaced or paid for by the borrower. Students must help in maintaining, keeping in order & organizing the books. They must put the books on the tables after consultation and not just anywhere on the shelves. Students are not allowed to bring their personal books or belongings to the library. Any child found damaging or defacing a book will be debarred from using the library for the whole academic year or will receive a yellow card. Facility for Photostat will be available in the library. They must maintain absolute silence in the library.